The Australian Trellis Door Company (ATDC) offers a wide range of rapid roll high speed doors suitable for use in fresh produce manufacturing, logistics and cold storage. Consider the challenges faced by a large scale producer of fresh produce. Take fruit as an example. Such facilities generally consist of processing areas, storage coolers, and cold loading docks. The cold loading docks need to be kept at specific temperatures. Storage coolers within the loading dock areas need to be kept at different temperatures to ensure product integrity. All areas need to be accessed by forklifts through numerous doorways. The processing area needs to be kept at another temperature, at a lower humidity level than the others, to prevent food from “sweating” i.e. condensation that can spoil the food. These different areas of the building need to be separated to help control temperature and humidity. Rapid roll high speed doors are a perfect solution. They operate quickly (high cycle time) preventing a large amount of warm air entering these areas when the doors are activated. This in turn lowers energy costs. The fabric of the doors also play an important role in temperature and humidity control, and hygiene. These doors can employ motion sensors to activate the doors if a forklift is approaching. This ensure forklifts don’t bump into them and damage them, requiring produce to be quickly moved to different locations of suitable temperature. What’s more, certain rapid roll high speed doors can withstand impact from e.g. 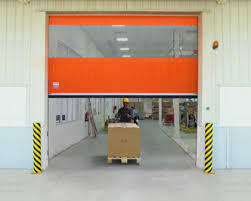 forklifts, meaning that if a forklift drives into these doors, they can reload themselves back into their tracks and continue operating as normal. This minimises costly maintenance and downtime.